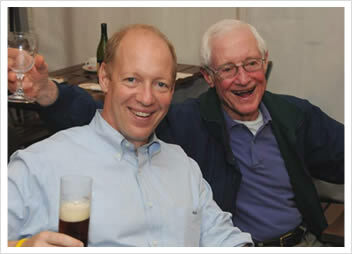 DRUPA, the worlds largest graphic arts trade show is well under way! 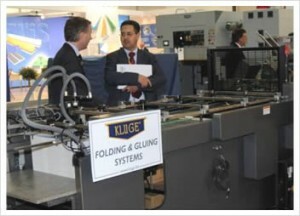 Here’s a little update on the happenings over in Germany at the Kluge booth. If you are heading to the show, or currently in Europe, it’s not too late to stop by the Kluge booth #E05 in Hall 11. So far Kluge’s booth has been bombarded with a steady stream of booth traffic. Evidently, the present state of the economy has not diminished attendance at the show and interest in our products. This is GREAT news! Print technologies are advancing at a continuing fast rate and DRUPA is THE place to see it first hand. 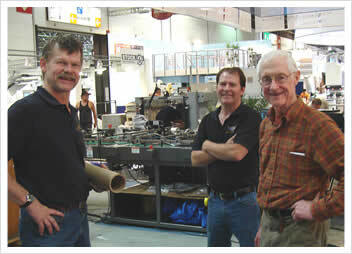 To date, there has been a great amount of interest in the all new V-10 Series 41″ Foil Stamping and Embossing Press. New features such as the large access door, pull-out drawer for the foil system as well as the brush roller assisted rewind system with waste bailer have been highlights of the machine. Pictured below is Brian Luecking one of our Service Technicians is busy working on the make-ready of the V-10 job. 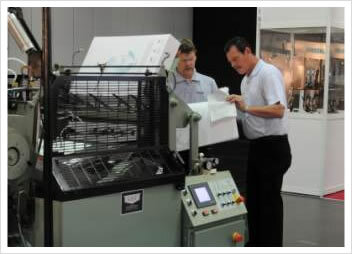 Mutt Wilson (Kluge) and Brian Hill of Kurz Transfer Products (below) examine a poster hot off the EHG Series Half Sheet Press. 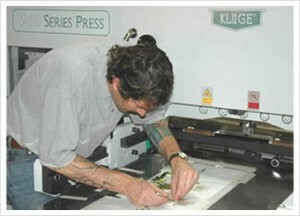 The EHG is new to the Kluge product line. The press magazine has been built with the EZ Load system. Here the user can lower and raise the height of the magazine with the turn of a knob, making for easy loading of stock into the machine (watch our video demonstration of this feature). Another key feature that the machine features is the Toggle Base Hoist System. The hoist assists the operator in the removal of the large toggle base for make-ready. Take a moment now to learn about the new foil stamping, embossing and folder gluer advancements that are being demonstrated right now on the Kluge booth #E05 Hall 11 at DRUPA 2008. There’s still time to make a personal appointment with Hank. Click here to schedule a day and time that fits your schedule. Look for our post show follow-up report soon!